Markets have a spring in their step after hitting new highs for the year on Monday. 1. 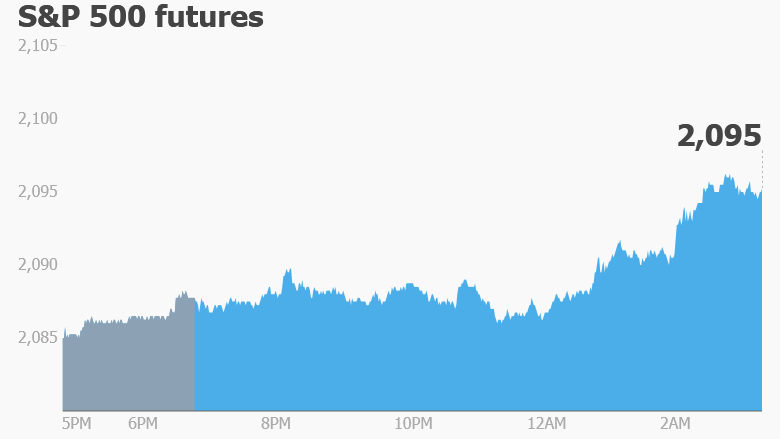 Stocks boosted by oil: U.S. stock futures are rising ahead of the open and European markets are making solid gains. Key indexes like the Dax in Germany and the CAC 40 in France are up by 1.3%. Most Asian markets also closed the day in positive territory. Market sentiment is being buoyed as traders watch oil prices recover. Prices plunged on Monday after many of the world's biggest oil producers failed to freeze production. Crude oil futures are now trading around $40 per barrel. "The oil market's willingness to get back to business as usual has been greeted by a loud cry of 'Party On, Dudes' in equity markets," noted Kit Juckes, a global strategist at Societe Generale. Oil will remain in focus as President Obama visits the world's biggest oil exporter -- Saudi Arabia -- Tuesday. 2. Earnings season: Earnings will be coming thick and fast on Tuesday. Goldman Sachs (GS), Harley-Davidson (HOG), Johnson & Johnson (JNJ) and TD Ameritrade (AMTD) are among the main companies reporting earnings ahead of the open. Tech giants Intel (INTC) and Yahoo (YHOO) are reporting results after the close. Investors are also hoping for more information from Yahoo about its future. Verizon (VZ) is widely expected to have made an offer for Yahoo. Intel is also in the spotlight after it was reported to be planning to lay off thousands of employees. 3. Stock market movers -- Netflix, L'Oreal: Shares in Netflix (NFLX) are tanking premarket after the company said second quarter subscriber growth would be below industry expectations. Shares in L'Oreal (LRLCY) are shooting higher after the French cosmetics group reported better-than-expected earnings and issued a sunny growth forecast. "[L'Oreal] management hosted an upbeat conference call reiterating confidence in the group's ability to outperform the market once again in 2016," noted equity analysts at Liberum. 4. Monday market recap: The Dow Jones industrial average crossed the 18,000 mark on Monday for the first time since July 2015. The index closed at 18,004 after rising by 0.6% over the course of the day. It's a pretty sweet milestone considering the Dow plunged to just 15,451 in January as Wall Street freaked out over the oil price crash and China's slowdown. The S&P 500 also jumped by 0.7% on Monday and the Nasdaq moved up by 0.4%.